Jennifer Miller could hardly believe the question. “When will your bananas be ready?” inquired a central Iowa woman who was buying fresh produce through Miller’s Clarion Sage market garden and community supported agriculture (CSA) business near Waukee. This disconnect isn’t all that foreign to Miller, who grew up in Highland Park, Illinois, a northern suburb of Chicago. “I had no contact with agriculture in Highland Park,” said Miller, who serves as the Iowa Food Cooperative’s member services coordinator. Miller did have a connection with Iowa, though, through her paternal grandparents, who lived in the Clarion/Rowan area. Her decision to move to Iowa in 2010 was spurred, in part, by a health challenge and new-found passion for healthy eating. After moving to Iowa, Miller got involved with community gardens in the Des Moines area and became a marketing/communications specialist Iowa Food Cooperative, which operates like an online farmers market. In 2013, Miller and her partner, Cody Kilgore, moved to an acreage on the southwest edge of Waukee’s city limits in Van Meter Township so they could operate their own farm. “It felt like coming full circle,” said Kilgore, who was raised in rural Missouri, worked in the corporate world for nearly 30 years and was ready for a career switch. 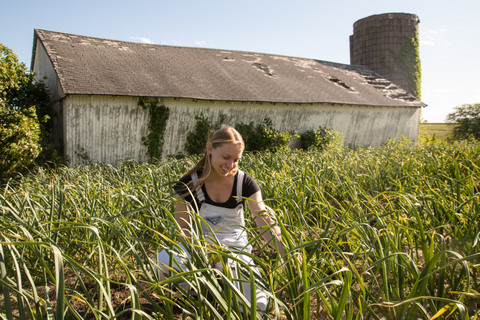 The couple planted garlic in the fall of 2013 to start their Clarion Sage market garden. The goal? “We believe in ultra-local and want to feed the community around us,” said Miller, who noted that Clarion Sage primarily serves families within a five-mile radius in southern Dallas County. Today, Miller and Kilgore raise a wide array of vegetables and herbs, including lettuce, squash, cabbage, carrots, garlic, tomatoes, cucumbers, peppers, potatoes and more, including heirloom varieties that can’t be found in most stores. They offer an online ordering system for added convenience. Jennifer Miller displays one of the unique lettuce varieties she grows at Clarion Sage Farm near Waukee. 1. Farming is more than production. Raising an abundant crop is just step one, said Miller, who has learned that that marketing and sales are equally important. 2. Mentors matter. 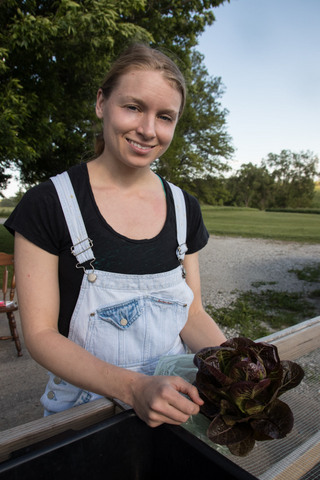 “I didn’t grow up gardening, so working for various produce growers in Iowa and beyond taught me so much,” said Miller, who is grateful for leaders like Angela Tedesco who started Turtle Farm near Granger, Jill Beebout from Blue Gate Farm near Chariton and other local food proponents who have mentored her along the way. 4. Catering to consumers can be tricky. While the Clarion Sage CSA is right on Waukee’s doorstep, some consumers don’t want to drive to the farm to pick up vegetables. Some feel they don’t have time, while others don’t like the way the gravel road makes their vehicle dusty. When Miller tried offering delivery, some consumers still rejected this option, citing a lack of time or interest in preparing fresh food. Even full-color newsletters filled with cooking tips and recipes failed to gain much traction with these types of consumers, said Miller, who plans to start selling her produce at the Downtown Farmers’ Market in Des Moines. 5. Urban sprawl is relentless. High-density residential projects are planned for the area near the Clarion Sage’s market garden. “We’re in the bullseye of urban sprawl, which is a challenge,” said Kilgore, who also works as a wedding photographer. 6. Local food pairs well with global flavors. Miller loves ethnic cooking, from Latin American to African. “If you want to add more vegetables to your diet, look to other cultures that don’t have an abundance of meat protein,” said Miller, who encourages people to try vegetables like Cherokee Purple heirloom tomatoes (known for their smoky, complex flavor), fish peppers (which pack more heat), Merlot lettuce (whose dark red leaves offer a mellow flavor) and fingerling potatoes (which taste great fried or roasted).